Click the images to the left to see a few sample pages. This book is a great companion piece to the Tiny Project Construction Plans. The book offers photos and insights into most every step of the construction process, providing a level of visual support that could not have been included in the plans themselves. This is an actual printed version of the book. 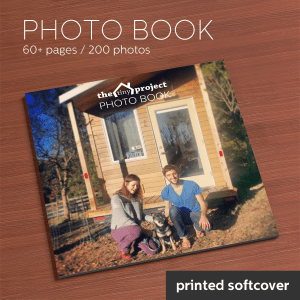 The product is printed and shipped directly from Blurb.com. I appologise that the price of this book is quite high, but that’s what happens when you want to include EVERYTHING. Rest assured the 62 pages with almost 200 photos will be well worth it! I am making the tiniest of profit off the sale of these books — they are sold to you almost at cost. This is an excellent resource book. I am a career advisor and keep this book in my library. Students are looking for affordable housing options and this book is a visual walk-through of how to build a tiny home on wheels.